Kenya: Kenya’s Mombasa Republican Council: liberators or nascent radical fanatics? Kenya’s Mombasa Republican Council: liberators or nascent radical fanatics? 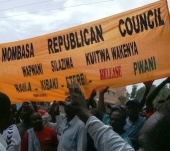 A group in Kenya’s Coast Province known as the Mombasa Republican Council (MRC) is causing controversy because of its demands for secession and its campaign to mobilise inhabitants of the coastal region not to participate in the forthcoming general elections. Concerns about the group are heightened by reports that its members are recruiting children and engaging in oath taking and illegal military training, similar to the actions of other infamous rebel groups on the continent. Formed in 1990s, the MRC, whose rallying call is Pwani Si Kenya (The Coast is not part of Kenya), was dormant until about 2008, when it publicly called for the establishment of an independent state to ‘liberate’ the coastal people ‘from mistreatment and marginalisation by successive Kenyan governments’. Due to these secessionist demands, the government declared it illegal in 2010, along with 33 other ‘organised criminal groups’. The MRC has since challenged the ban in court while, instructively, also becoming more bellicose and tenacious in its demands. The MRC’s secession claims are, however, rooted in history and can be traced to a 19km-wide strip known as Zanj, established under the influence of Zanzibar, itself controlled by the Sultan of the Persian Gulf state of Oman. Later the strip was administered by the British as a protectorate. At the 1963 Lancaster negotiations for Kenya’s independence it was recommended that the coastal strip be officially made part of Kenya and the Sultan of Zanzibar be compensated for the loss. Some in the MRC claim that there was a separate 50-year lease agreement signed by Kenyan Prime Minister Jomo Kenyatta and his Zanzibar counterpart Mohamed Shante in which the Kenyan coastal strip is integrated into Kenya. The MRC claims that this lease expires next year, when the coastal strip should ‘regain’ its independence. Reading both the Lancaster agreement and the 1963 Memorandum of Understanding between Kenyatta and Shante, however, there is no mention of a 50-year lease agreement or secession. Instead, both reiterate the recognition and preservations of Muslim freedoms, jurisdiction and freehold land leases in post-independence Kenya. Today, many people in the Coast Province do not seem to support the MRC’s secessionist calls, although they strongly back the group’s other substantial grievances around land issues and the dominance of the local coastal economy by people from other regions of the country. The land issue is a big problem in Kenya, where the elite and influential people have, since independence, capitalised on their patronage to register themselves as land owners. As a result people at the coast remain squatters and accuse the Kenyan government of marginalisation, discrimination and neglect. The MRC also argues that despite the fact that the Coast Province is a major contributor to Kenya’s economy through tourism and the port of Mombasa, locals remain among the poorest in country. It is this perception around skewed development that is propelling ‘coastal nationalism’. However, the group seems to be selectively using historical documents to advance its leverage. The Kenyan government has publicly maintained that the MRC’s motives are not conducive to stability and unity in the country. It has cited Article 3(2) of the Constitution, which outlaws any attempt to form a government that is not in line with the country’s new Constitution and other articles that negate any attempt to change the territory of Kenya to justify its position. It has instead urged members of the MRC to channel their grievances through the new Constitution, which provides for the devolution of resources and avenues to deal with past land injustices, including the codification of Kenya’s National Land Policy. Given the geostrategic importance of the coastal strip to Kenya, it seems unlikely that the government will accede to the MRC’s demand for secession in the foreseeable future. Nonetheless, dealing with the MRC might not be as simple as it seems given the life cycles of similar groups in the region that are founded on genuine grievances and which over time grow into terrorist or criminal networks. The MRC’s strength is yet to be established, but political commentator Charles Onyango-Obbo suggests that its base is currently fewer than 500 000 people. Worrying, however, are allegations that the group has set up a military wing that trains inside the Mulungunipa forest on the Kenyan South Coast. This contradicts the group’s non-violent claims. The African continent has witnessed similar groups such as Boko Haram, the Niger Delta militants and the Lord’s Resistance Army being founded on social-historical grievances and non-violent approaches only to transform over time into violent and radical groups. The failure to address their underlying grievances and resort to military solutions instead is what proved counterproductive. This does not necessarily mean that all social movements eventually turn into terrorist groups. A key variable in their transformation seems to be the way governments respond to their genuine grievances. As Kenya moves towards the next general elections in 2013, political campaigns show different perspectives on the MRC, with some leaders softening their stance towards the group in a hope to attract votes. The fear is that politics might just boost the MRC’s importance, especially if politicians and top businessmen eyeing political offices resort to funding the group and using its youths to advance their political causes, as is being alleged. In 2007/08, a number of Kenyan politicians were accused by the International Criminal Court (ICC) of collaborating with groups like the Mungiki to perpetrate retaliatory attacks. While some have been urging for negotiations with the MRC, the government faces a dilemma in that public negotiations with the MRC means it has to open up talks with other illegal groups, some of whom are purely criminal. The MRC has been involved in incidences of violence, but the government needs to avoid actions that could lead to confrontation in order to prevent militarising it, which will be compounded if the group establishes links with extremist groups from neighbouring Somalia, some of whom have operational bases in Mombasa. In the short term, the government of Kenya needs to find ways, including discreet ones, to dissuade the group’s leadership from supporting violence. It would then need to establish its goodwill and at least seek to pacify it through mutual engagement. In the medium and long term, the Kenyan government and others in Africa facing similar challenges should respond to local grievances and ensure inclusive, fair and participatory processes in the distribution of national resources. This is essential if they want to prevent similar social formations that emerge to advocate for legitimate rights only to transform and threaten the security and integrity of the state.